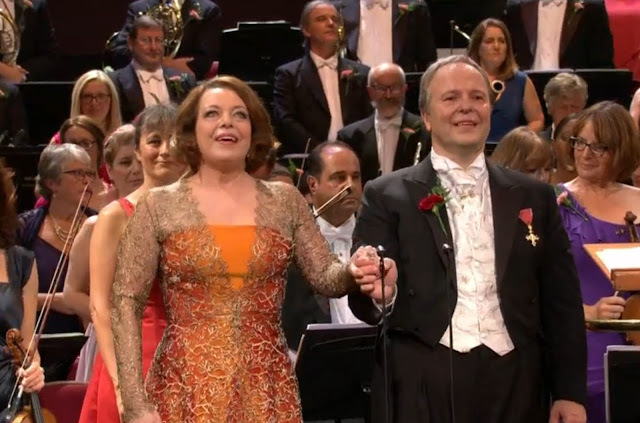 Nina Stemme at the Last Night of the BBC Proms 2017. She was not the only one left open-mouthed by this year's Non-Event LNOP, which was as vision-free as most of the this year's season. Formula works, to some extent. Stemme is such a megastar that even those who know zilch about music know who she is and that she does Wagner. 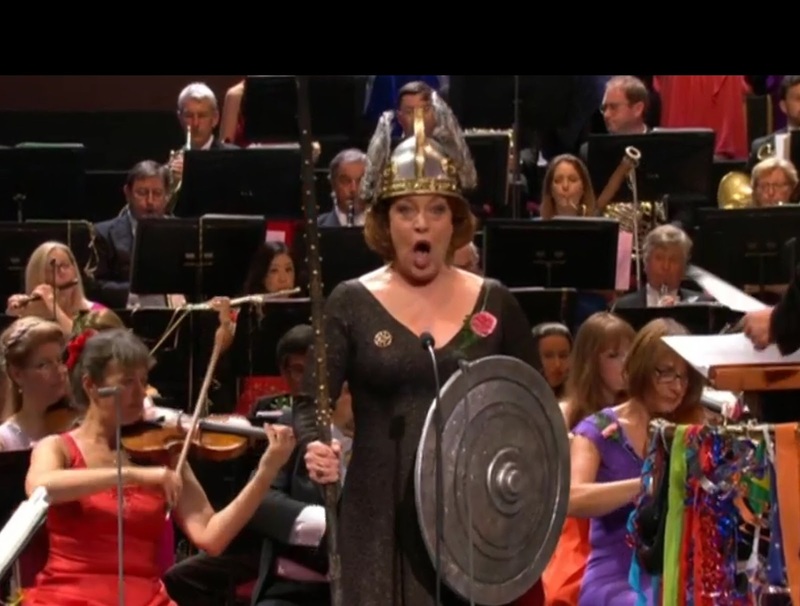 So nil imagination needed to make her do Brünnhilde while singing Rule Britannia. So no-one really goes to the Last Night for music. But Nina Stemme deserves better ! She's an artist not a cartoon. A few years back, Roderick Williams did it in street clothes. That was infinitely more sincere and moving and more in the spirit of the anthem. Dressing up is all very well, but it needs to be done with genuine flair and humour, the way Juan Diego Florez did last year as Inca Prince and the skit on Paddington Bear as homeless immigrant. (Please read more here). It's not Stemme's fault. It's the marketing philosophy behind the Proms these days that puts commercialism above music. Formula is all very well and, thanks to formula, there were many good Proms this year, scattered around the crass detritus. Thanks to good performers who actually like music, not the suits behind formula. How did the Royal Albert Hall get its name ? The vision of a Prince who believed in excellence and learning. Who created the Proms ? A man with vision who loved music and believed that ordinary people could appreciate serious music which wasn't dumbed down. Instead, we're now locked into the "Ten Pieces" mentality, probably the worst case of moronic, musically illiterate goonishness ever. The first year, it was a gimmick but repeated and extended it's become a joke that's gone stale. Yet again, formula without vision. Alan Davey claimed "Don't apologise for classical music's complexity. That's its strength". So if he really believes that, why not act on it? For a start, the BBC should scrap the Ten Pieces groupthink and get rid of those behind it. Funnyn how Nigerl Farage and his pals in the media are attacking those who handed out EU flags, while conveniently forgetting that Aron Banks, w2ho bankriolled Brexit and UKIP did the same stunt last year. What also makes the Last Night great is the sense of spontaneity and irreverence. This is why it responds so well to current affairs and social conscience. The Conductor's Speech varies, but the best have been the ones which came from the conductor's heart. That's why conductors need freedom. The job usually falls to the Chief of the BBC SO, the BBC's flagship orchestra, which works so hard all year around. Sakari Oramo's a genial, engaging character, with integrity. No firebrand he. But this year, he was reading a script so banal it sounded like it had been cobbled together by BBC management. All bullet points and mealy mouthed platitudes. Like the bit about women conductors. If the Proms really cared about women, why stick to one token conductor, moulded by Bernstein, whose speeches were self-promotion as opposed to the common cause? Oramo is a good speaker because he's real. Rumour had it that the political powers that be, in whose hands the BBC's fate lies, wanted to control the LNOP speech. And perhaps they did. But if such politicians and those who influence them (to put it gently) were so secure in their beliefs, why would they feel threatened by Barenboim and Igor Levit? We don't live in truly democratic times but in a world where those who control the media control minds and use their power to bypass parliamentary process and the very right to dissent. Fact is, most people in the music business, and in the business world in general, have experience dealing with the complexities of the situation. Regular Prommers, the ones who come all season for the music, not just for LNOP, often think on the same lines. So why the fear? In a democracy, you live with alternatives, you don't suppress them. Nice enough music, though the LNOP isn't really about music. Most memorable apart from Stemme's Liebestod, were Sibelius's Finlandia Hymn in the version made in 1941 with a text relevant to the war between Finland and Russia, and Zoltán Kodály Budavári Te Deum with Lucy Crowe, Christine Rice, Ben Johnson (looking natty in a beard) and John Relyea. Good stuff from the BBC Singers and BBC SO Chorus. Much lesss edifying, though, tye pieces by Mlcolm SAargeant, w2ho was a great marketeer, and \John Adams, both of whom included to fulfill the obssession with formul themes, not for intrinsic musical value. Many improvements this year in the physical management of the Proms, like not letting latecomers enter willy nilly, and exceptionally helpful ushers and security staff. The people at Door 9 in particular deserve praise, though praise from the public doesn't often get relayed down to the folks on the ground. The presenters are less hyped-up, too, thank goodness, though some of the chat shows were dire. So many thanks to someone getting things as right as possible. Hopefully those standards of excellence will apply in future to artistic policy and (dare I say) the Vision Thing.